We’re all accustomed to seeing textbook gardens on television with the same types of plants planted together in picture-perfect rows. Did you know that mixing up the types of produce you plant make a natural deterrent to insects and pests? When you’re planting a vegetable garden, it’s common practise to plant each type together, e.g. all tomatoes in one row and all onions in another row. Plants like garlic, onion, marigolds, chives and lavender can repel a variety of annoying pests when planted next to your vegetables. Make sure you plant these natural deterrents in or around your veggie patch, and most pests will be put off entering. Besides the fact that pests will not munch away at your vegetables, there are many other benefits to using this method. The first benefit is that it is much cheaper. Consumers are conditioned to buy expensive products that are manufactured to get rid of pests, and while these products do work, it can run up your nursery trip bill by a few hundred dollars. Another benefit is that using other plants to prevent pest infestation is healthier for your vegetables. While chemical-based products are designed to be as gentle to plants as possible, the reality is that it’s still a chemical. Any type of chemical can have a negative impact on your flowers or vegetables, on either the growth cycle or appearance. That’s why it’s best to stick to natural deterrents. 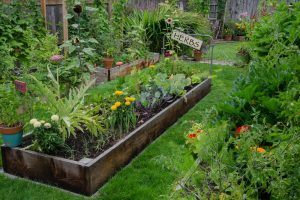 Herbs are a great option to incorporate in your veggie garden. Rosemary, Mint, Thyme, Lemongrass and Basil all repel mosquitoes and flies leaving your vegetables free to grow beautifully. Flowers such as Lavender and Alliums – both purple in colour – are natural insecticides, look beautiful in any setting and emit a lovely scent throughout your garden. Get your green fingers on and start planting!